Preheat oven to 400 F. Line a baking sheet with parchment paper or foil. In a medium saucepan or pot, bring pumpkin seeds, water and salt to a boil -- approximately 2 cups water for every 1/2 cup pumpkin seeds and 1/2 tsp salt for every cup of water. (See notes). Bring to a boil, simmer for 10 minutes, drain and discard water. Arrange seeds in a single layer on the prepared baking sheet. If there is not enough room, prepare a second sheet or roast in batches. Combine dry ingredients in a small bowl. Sprinkle spice mixture over the seeds and roast for 20-25 minutes or until seeds are golden brown and fragrant, stirring once or twice halfway through. 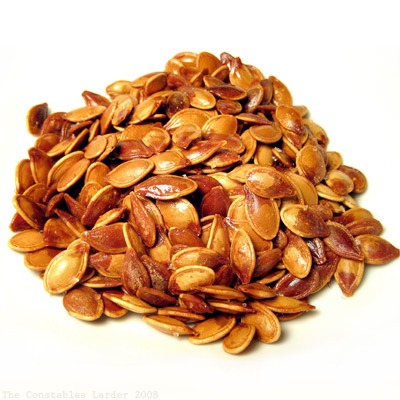 Allow seeds to cool slightly (5-10 minutes) and enjoy! Store in an airtight container for up to 4 days. Oil is listed in the ingredients but not in the instructions. Where should it go at the beginning of step 3? "Mix drained seeds with olive oil and arrange in single layer..."
You've carved up your pumpkin, leaving a nice pile of sticky, slimy "guts" on the countertop. What do you do? In minutes, you can have a super healthy and allergy friendly snack that everyone will love! Gluten free & wheat free, GFCF, dairy free, vegan, vegetarian, eggless, soy free, corn free, grain free. 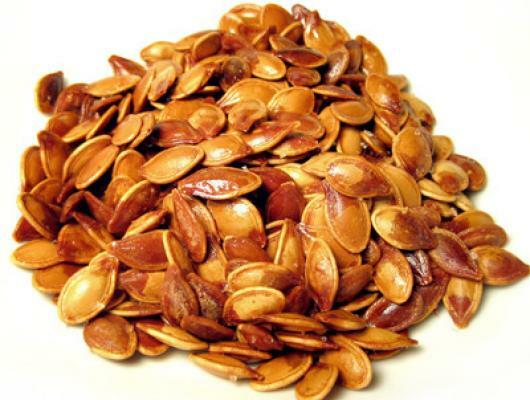 To Clean Your Pumpkin Seeds: simply place in a large bowl and slowly rinse with water, separating out the stringy pieces of pumpkin flesh still attached. To Boil Seeds: for example, if you have 1 cup of seeds, bring 4 cups of water and 2 tsp salt to a boil.